When I switched over from iOS to Android as my daily driver, the first thing that I ensued was the quest for battery optimization. It’s no hidden truth that iOS beats Google’s cute little droid hands down in this arena, and if someone claims otherwise, they might want to try reaching out to the likes of Guinness World Records or something, for that matter. Nevertheless, despite the platform’s own shortcomings, there are always steps that one can take to maximize the potential that the Li-ion cells in the back of your handset have to deliver. In my experience, with both the human ailments and battery retention problems, identification and diagnosis of cause is half the treatment. While the first is better addressed by doctors, to achieve the latter, you need to have the required tools in place to help you out. Android’s own battery usage monitor, although helpful, lacks a certain level of detail that becomes necessary when you’re in for some serious troubleshooting. Here, third-party apps come into play, to get you as detailed a look as possible into exactly what is using how much battery, and why. In that category, while there is no shortage of contenders in Google Play Store, there are few that match the comprehensiveness and reliability of Better Battery Stats (BBS). 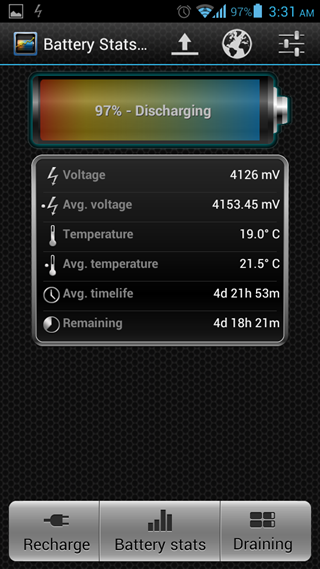 Then, over time, we have covered some tools ourselves, too, like Battery Doctor, which gives estimates (and tips) for remaining time under various scenarios, or the much more powerful Badass Battery Monitor, which gives BBS a tough time in the comprehensiveness of its reporting. 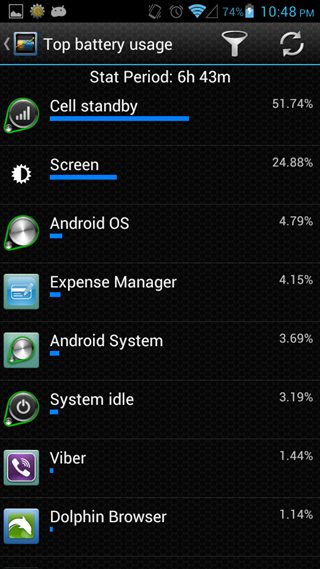 Entering the ring now is Battery Stats Plus, a BBS-like application from XDA Developers’ member leducbao. The app is in its beta test phase as of this writing, and available exclusively through the XDA forum link provided at the end of this article. What it aims to provide in particular is the per-app battery usage for your Android, categorized by attributes such as CPU, foreground, GPS, network, sensors, partial wake locks, and more. The three main areas of operation for Battery Stats Plus are the charge/discharge cycle, the stats that it can report under various filters, and potentially harmful apps for your battery. 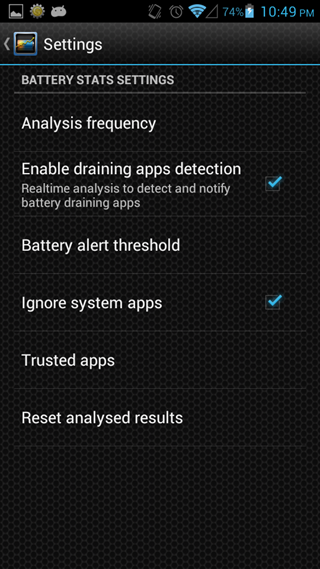 The last one is of particular interest in this regard, since this feature analyzes all the installed (and running) apps on your smartphone or tablet, and recommends which ones you need to watch out for as being responsible for heavy battery drain. While some of the suggestions might not be very accurate, others will truly help you identify and apprehend the bigger culprits, and hopefully gain some on precious battery juice. In my first day of usage with Battery Stats Plus, I found its estimation of remaining time to be rather… wishful, at best (oh, should I be so lucky! ), but considering the app is in beta testing, we can only hope for things to get better. 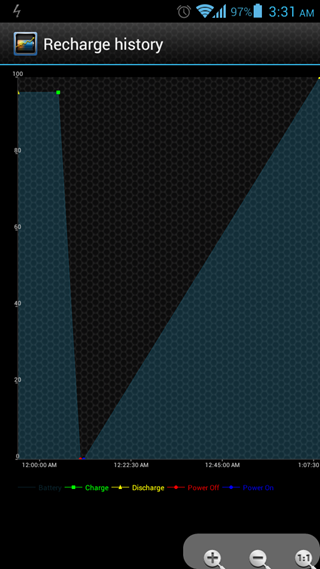 The truly unique aspect of Battery Stats Plus was, sadly, also the one that wasn’t working during our testing. It offers cloud based reporting, where your battery stats are uploaded and compared against others’ reporting from similar devices. 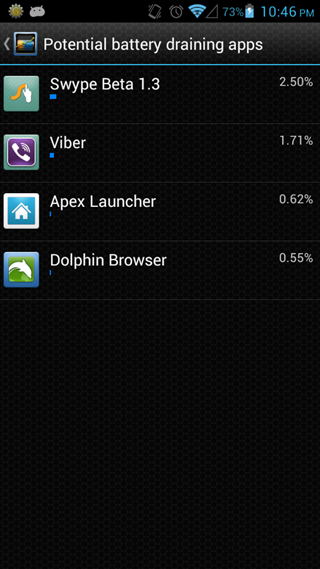 Likewise, per-app usage can also be pitted against the community average, all by visiting a simple URL http://battery.rootuninstaller.com/start. None of these, however, was functional at the time of my testing, and all I got was a plain old error message. Battery Stats Plus is certainly a commendable effort on the developer’s part, and I hope that it will continue to develop better and better as more work is done and more stability attained. For now, it’s reporting stats present a good balance between those of BBS and Badass Battery Monitor for Android, and it seems that the app tries to combine the best of both worlds. If you are looking for a good reporting tool for advanced battery attributes on your Android, head over to the XDA source link below to grab the APK.